Angie reported that temperatures back home in England had dropped to -1 C during the night but had climbed back to double figures during the day. Here in Australia, Spring produced higher temperatures than England in the heat of summer! At the Convention I had shown John and Terry a 6 minute movie clip from a trip through Huasteca Canyon, near Monterrey, NL, that included images of Agave albipilosa. 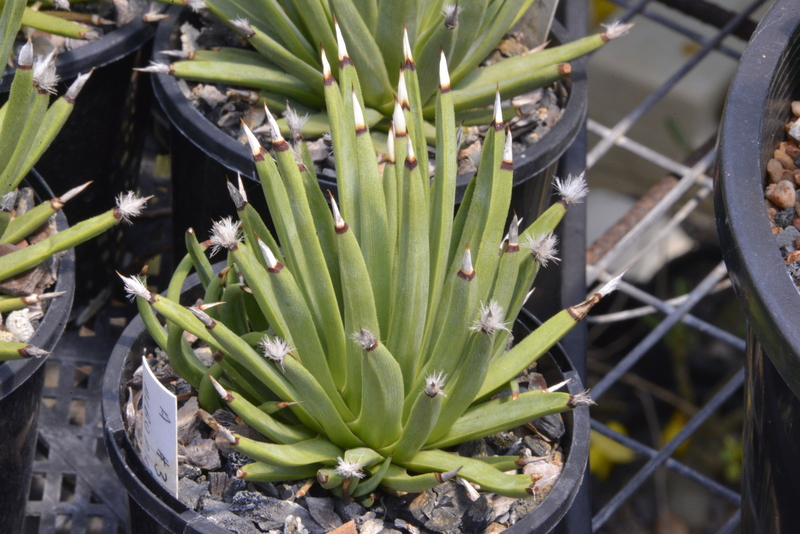 These would be highly desirable plants if the fluffy bits at the end of the leaves were present by the time that nursery men like to take their plants to market, at around 18 months. In England, plants raised from seed some five years ago were still without fluffy bits. Terry said that his plants were some three years of age and had produced their fluffy bits after three years, so I was happy to take some pictures. 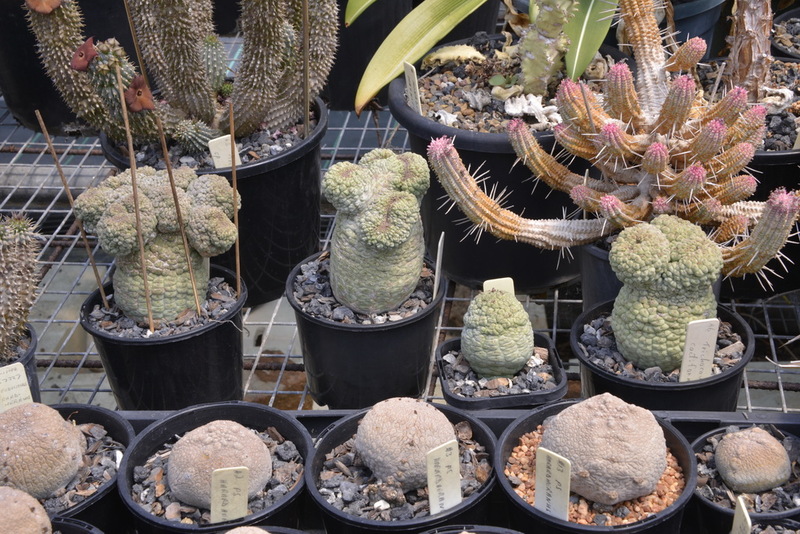 I had already seen evidence of Terry’s growing skills in his Asclepiad presentation, but I was now looking at quite a number of plants representing all the taxa in the impossible to grow (for me) Pseudolithos. It turns out that these plants all come from Somalia, probably in another fog desert. More travelling for me? No thanks, Somalia is currently just a little bit too dangerous for my liking. Some of the Pseudolithos plants looking in great shape. In England the frequent sound of rain on the greenhouse roof might kill them! While enjoying our chat about cultivation tips, I suddenly came over very dizzy. I beat a hasty retreat to the shade of the veranda where Terry’s wife provided a couple of glasses of cold water that I sipped down and immediately started feeling better. The temperature on the shaded veranda was 34 C, while where Terry and I had been chatting in the sun, the temperature was around 45 C. A timely warning of how high temperatures can creep up on you when you’re distracted by great plants! I’ll be sure to wear my hat and look for the shade in Mexico, where in autumn / Fall, temperatures can still soar.